Thirty ladybugs will quite suffice. 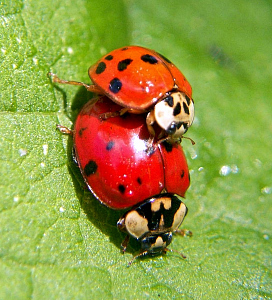 Fifty-two ladybugs are a nation. I lost count at 74 ladybugs last week. 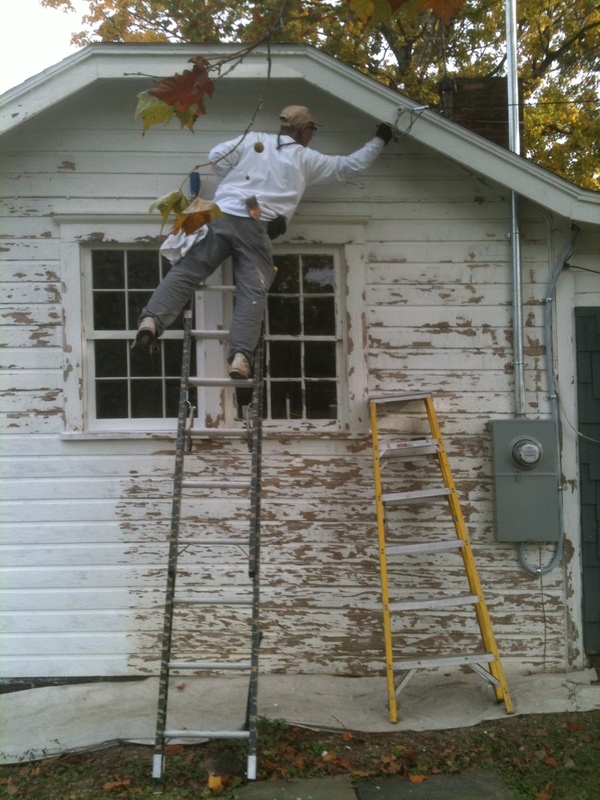 We were planning on painting an outside wall of the cottage; the day before we had finished scraping, caulking, and priming. Getting a coat of paint on that northwest side of the house, before the really bad weather set in, seemed judicious. As we were priming, there were a few ladybugs here and there, but nothing to remark about. Although Michael did say “Now that I’ve caulked up all the holes, the bugs will either be inside or outside.” Very prescient. Yes, I know, bad poetry abounds. Bad times call for bad rhymes. Remember when you were a kid and a ladybug landing on your sleeve was good luck? I remember running into the house with a lovely RED ladybug on my hand, shouting for everyone to look. We had to say the rhyme, “Ladybug, Ladybug fly away home, your house is on fire and your children will burn” before she flew away. But all ladybugs in this country did used to be red, not orange or yellow or plain. Remember? The first ladybug I saw at the cottage this summer was red. I thought, “Yes! 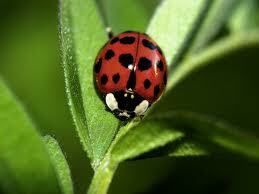 I am back in the countryside where there are real ladybugs again.” I haven’t seen another red one since. 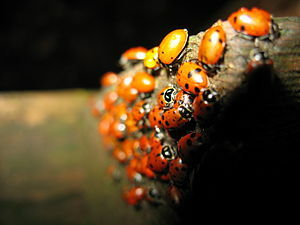 They are all that sickly rust-colored Asian ladybug Harmonia axyridis. This Asian lady beetle was introduced in the seventies (by the U.S. government) to control aphids on several agricultural crops, including pecans and soybeans. They are larger and more aggressive than our native ladybugs coccinella novemnotata, more commonly known as the nine-spotted ladybug. They not only eat aphids, but also crops (grape growers are calling them pests) and they are being accused of eating the larvae of the native ladybugs as well. Most people believe the imported species has caused the decimation of the native species. Cornell scientists are studying the problem and are trying to reintroduce colonies of the native species. 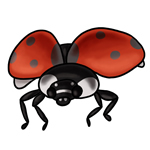 You can read about the Lost Ladybug Project here, and perhaps even become a Citizen Entomologist! I’m joining up! 2. Is That Ladybug Carrying a U.S. Passport? and don’t forget to read Eric Carle’s classic picture book The Grouchy Ladybug. No wonder she’s having a bad day — she’s being eaten by non-native species! Michael looks precarious on the ladder! Thanks for the lady bug lesson. We didn’t know this. It never seems to work to introduce a species from Asia. They always take over it seems. I know! You’d think we’d realize about importing species by NOW! As someone already stated, at least they weren’t stink bugs, although too many bugs are too many bugs- no matter how cute. I am having a stinkbug invasion this year. My neighbor has the lady bugs. She swears by putting Vick’s salve where they gather. Your cottage, at least from this side, is adorable!